The color of a cloud depends primarily upon the color of the light it receives. The Earth's natural source of light is the sun which provides 'white' light. White light combines all of the colors in the 'visible spectrum', which is the range of colors we can see. Each color in the visible spectrum represents electromagnetic waves of differing lengths. The colors change as the wavelength increases from violet to indigo to blue, green, yellow, orange, red and deep red. Visible light is only a small portion of the full electromagnetic spectrum. As a light wave's length increases, its energy decreases. This means the light waves that make up violets, indigo and blue have higher energy levels than the yellow, orange and red. One way to see the colors of sunlight is by the use of a prism. The velocity of light decreases slightly as it moves into the prism, causing it to bend slightly. This is called refraction. The degree of refraction varies with the energy level each wave. A prism will allow you to see the individual colors that comprise the source light. In this case, sunlight entering the prism is divided into the colors of a rainbow based upon the wavelength of each component. The lowest energy light waves refract the least, while the highest energy waves exhibit the greatest refraction. The end result is a dispersion of light into a rainbow of colors. Rainbows are partly the result of sunlight refraction through a rain drop, which acts like a prism. So, if sunlight is 'white', why is the sky blue? The atoms and molecules comprising gasses in the atmosphere are much smaller than the wavelengths of light emitted by the sun. As light waves enters the atmosphere, they begin to scatter in all directions by collisions with atoms and molecules. This is called Rayleigh scattering, named after Lord Rayleigh. The color of the sky is a result of scattering of ALL wavelengths. Yet, this scattering is not in equal portion but heavily weighted toward the shorter wavelengths. As sunlight enters the atmosphere much of the violet light waves scatter first but very high in the atmosphere and therefore not readily seen. Indigo color light waves scatter next and can be seen from high altitudes such as jet airplanes flying at normal cruising altitudes. 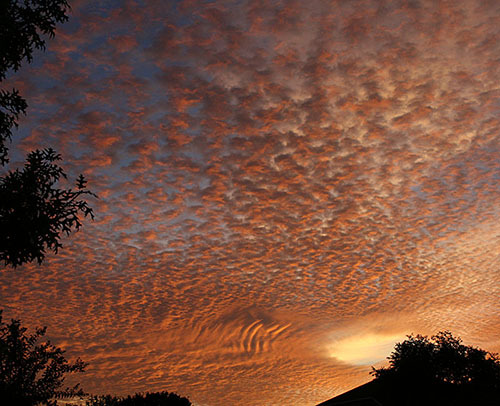 In this sunrise image, the blue sky, yellow Cirrus clouds and orange Altocumulus clouds result from both Rayleigh and Mie scattering. Rayleigh scattered produces blue sky and the color the clouds receives. Mei scattering is responsible for the color we see. Even with Rayleigh scattering taking place in the atmosphere, over one-half of the sun's 'white' light continues through the atmosphere reaching the earth's surface. Next, blue light waves scatter at a rate about four times stronger than red light waves. The volume of scattering by the shorter blue light waves (with additional scattering by violet and indigo) dominate scattering by the remaining color wavelengths. Therefore, we perceive the blue color of the sky. If the sky is blue, why are clouds white? Unlike Rayleigh scattering, where the light waves are much smaller than the gases in the atmosphere, the individual water droplets that make up a cloud are of similar size to the wavelength of sunlight. When the droplets and light waves are of similar size, then a different scattering, called 'Mie' scattering, occurs. Mie scattering does not differentiate individual wave length colors and therefore scatters ALL wave length colors the same. The result is equally scattered 'white' light from the sun and therefore we see white clouds. Yet, clouds do not always appear white because haze and dust in the atmosphere can cause them to appear yellow, orange or red. And as clouds thicken, sunlight passing through the cloud will diminish or be blocked, giving the cloud a grey color. If there is no direct sunlight striking the cloud, it may reflect the color of the sky and appear bluish. Some of the most picturesque clouds occur close to sunrise and sunset when they can appear in brilliant yellows, oranges and reds. The colors result from a combination of Rayleigh and Mie scattering. As light passes through the atmosphere, most of the shorter blue wavelengths are scattered leaving the majority of longer waves to continue. Therefore the predominate color of sunlight changes to these longer wavelengths. Also, as light enters the atmosphere, it refracts with the greatest bend in its path near the earth's surface where the atmosphere is most dense. This causes the light's path through the atmosphere to lengthen, further allowing for more Rayleigh scattering. As light continues to move though the atmosphere, yellow wavelengths are scattered leaving orange wavelengths. Further scattering of orange wavelengths leaves red as the predominate color of sunlight. Therefore, near sunrise and sunset, a cloud's color is what sunlight color it receives after Rayleigh scattering. We see that sunlight's color due to Mei scattering which scatters all remaining wavelength colors equally. A depiction of three hypothetical waves of light passing through the earth's atmosphere. A) Sunlight barely enters the atmosphere. Therefore only the violet and indigo colors are scattered. B) After violet and indigo colors are scattered first the sunlight penetrates further into the atmosphere where the greatest portion of blue scattering occurs. There is some bending of light by the atmosphere due to refraction adding some length to the light's path. Just as the light path begins to leave the atmosphere the color is predominantly yellow. C) Greatest refraction and longest light path with the most Rayleigh scattering. Sometimes, under direct sunlight, clouds will appear gray or dark gray against a blue sky or larger backdrop of white clouds. There are usually two reasons for this effect. The clouds may be semi-transparent which allows the background blue sky to be seen through the cloud. Thereby giving it a darker appearance. A more common reason is the contrast between the background (blue sky or additional clouds) and foreground cloud overwhelms our vision. In essence, our eyes are tricked with our perception of foreground clouds appearing dark relative to the overwhelming brightness of the background. This latter reason is why sunspots look dark. Brightness of the sun is based upon temperature and a sunspot's temperature is lower than the surrounding surface of the sun. Relative to the surface of the sun, sunspots appear quite dark. However, if sunspots were isolated from the surrounding brightness, they would still be too bright to look at with the unprotected eye. The contrast in brightness between the two is what causes sunspots appear dark.